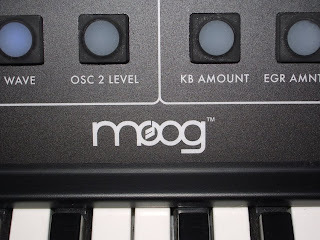 Groove Criminals: Moog baby Yeahhh! Okay, we're pretty one dimensional when it comes to our interests, so when we decided that a prezzie was in order as a plain and simple bribe after a hard couple of months work it was going to be something for the studio. 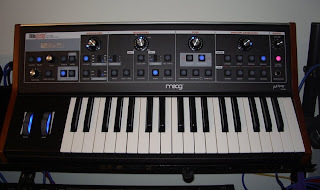 We kinda had our eye on a Moog of some sort and when this little beauty popped up for sale locally we just had to have it. It's a Moog Little Phatty (Bob Moog tribute edition), in fact it's a ltd edition one with DVD and poster - number 1054 of 1200.